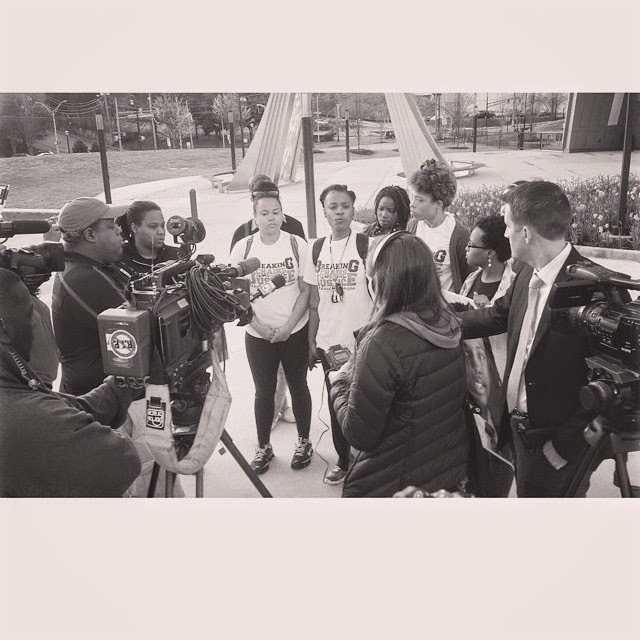 Today American Friemds Service Committee is excited to provide support to Atlanta-based grassroots organization, The CommUNITY, as they lead a march from Atlanta, GA to Valdosta, GA, to raise awareness in the case of Kendrick Johnson. Johnson was found dead on January 11, 2013 in the gymnasium of Lowndes High School in Valdosta, amidst now notoriously questionable circumstances. Johnson, 17 at the time, was a junior at Lowndes High. Marchers will be walking 17 miles per day, to symbolize Kendrick Johnson’s age when he passed, with shuttles assisting progress by night, and seek to arrive in Valdosta early on the afternoon of Monday, April 6th. Organizers from The CommUNITY will be delivering a letter to authorities at Lowndes High School, requesting a moment of silence for Johnson (something which has not occurred to date), at the school’s graduation on May 23rd, as well as an honorary diploma for Johnson, who would have graduated this year. They are asking this diploma be given to his sister, Kenyetta Johnson, who was denied the opportunity to walk the stage at her graduation last spring, due to the controversy surrounding her brother’s case. Representatives from a variety of activist groups and churches will be in attendance at the march’s launch, and have offered financial and logistical support to marchers. Many of the supporting groups, and The CommUNITY, have been involved in recent activism around civil rights and police shootings in Georgia, and see a direct tie-in to the Johnson case: “We march 17 miles a day, marking the years he lived. We march in remembrance of ALL lives lost, and all lives we advocate to save. We march to protect those that fight every day to live,” said Queen K, of The CommUNITY. RFRA Bill Defeated in Georgia! American Friends Service Committee wants congratulate all who have worked tirelessly against discrimination, including legislators and the many different groups who fought for the defeat of Religious Freedom Restoration Act in Georgia! 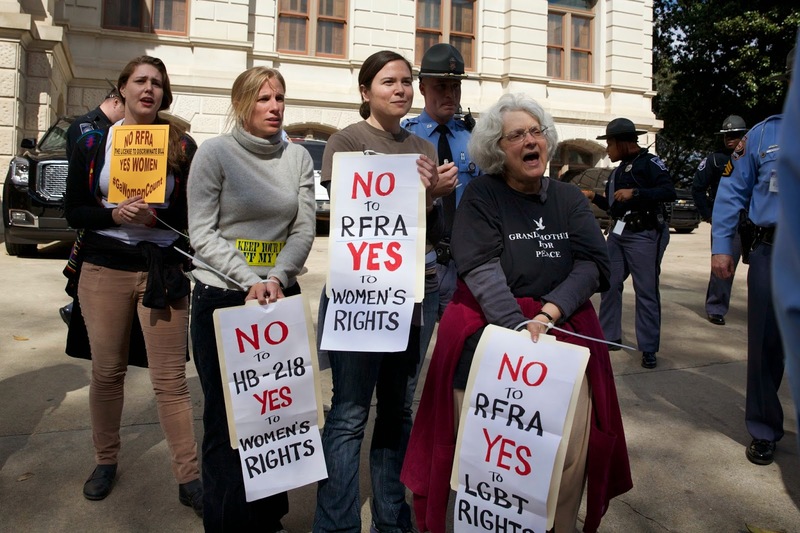 We are grateful for the leadership and work of Georgia Equality, and we know that in the final days amazing organizing work in Indiana may have been the straw that broke the camels back for RFRA in Georgia. We are especially proud of Moral Monday Georgia Participants, Emma Stitt, Jess Reznicek, Lorraine Fontana, and Megan Harrison, who went to jail to highlight the issues, and we are deeply moved by the sacrifice of two women, Emma and Jess, who courageously chose not only to stay in jail until RFRA was defeated, but await release on the state’s accord in solidarity with other women not able to bond out. Their willingness to put aside the comforts of freedom to shine a spot light on the door to discrimination that RFRA would have swung open is nothing less than heroic. Jess and Emma’s personal sacrifice was driven by their Christian faith, which provided a one of many religious voices against RFRA across the country. Defeating RFRA is an important victory for all Georgians. As we celebrate we must not forget that the sponsor of the bill, Senator Josh McKoon has been very clear about his intention to introduce the bill again next year and his unwillingness to add an amendment which would bar the law from being used to discriminate against anyone. We look forward to honoring Emma and Jess with a celebration upon their release. 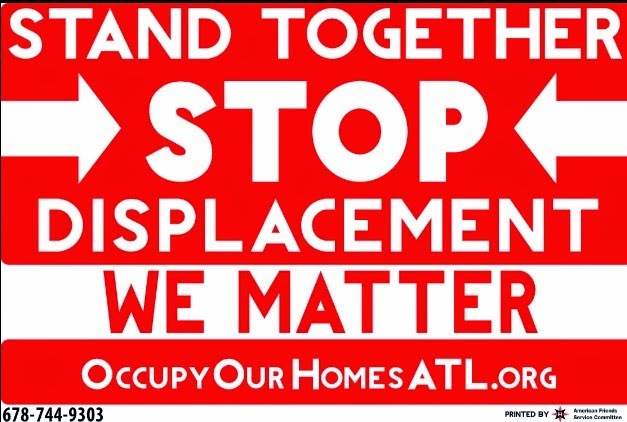 American Friends Service Committee, working through Occupy Our Homes Atlanta, has been engaging in some amazing work around the Turner Field Area communities. As some of you may know last year we worked with dozens of Peoplestown residents to facilitate a listening project. Our findings were that affordable housing was at a crisis level, low income housing units were approacing unliveable conditions, and there was a major lack of access to fresh food that stretch well beyond Peoplestown. With the Beltline project moving in and the Atlanta Braves moving out the communities around Turner Field have caught the eye of developers in a big way. We've already seen a huge spike in rental prices. Development isn't a bad thing, in fact folks want to see their communities developed; folks want development that benefits those that have lived in the community for decades. This get to a core belief of AFSC's Atlanta Economic Justice Program; that communities should be controled by those that live in them. 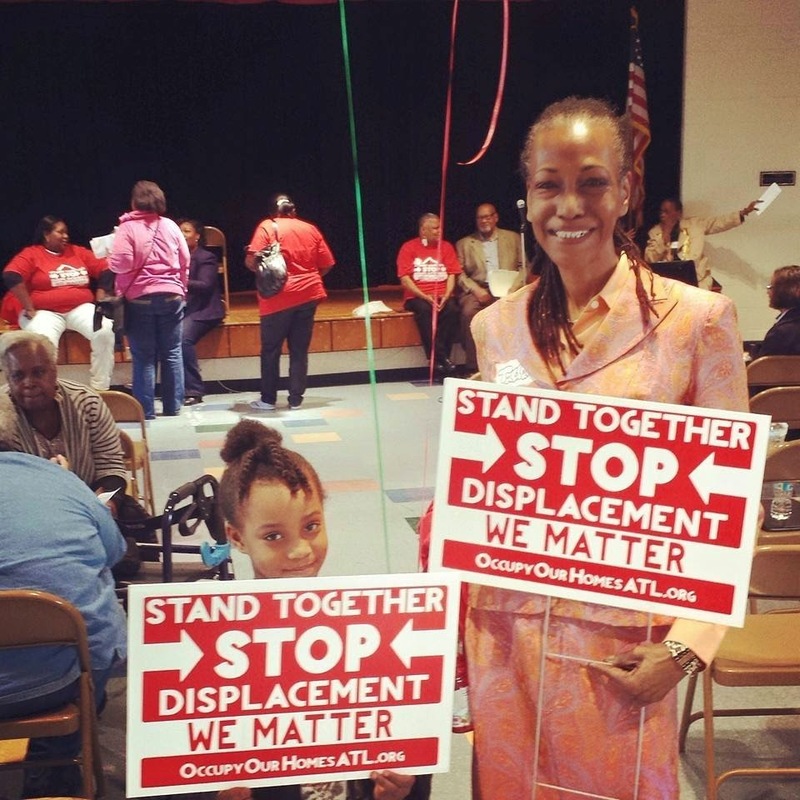 We are working with residents in Poeplestown, Mechanicsville, Summerhill, and Pittsburgh to launch housing justice/anti displacement campaigns, support community gardens, and insure that real affordable hosuign and community contro, of land is part of any benefits package that comes out of the Turner Field Agreements. We have some quick needs for resources to cover specific costs. I hope you will consider taking a look and investing what you can into the efforts of these amazing residents standing up against tremendous odds. 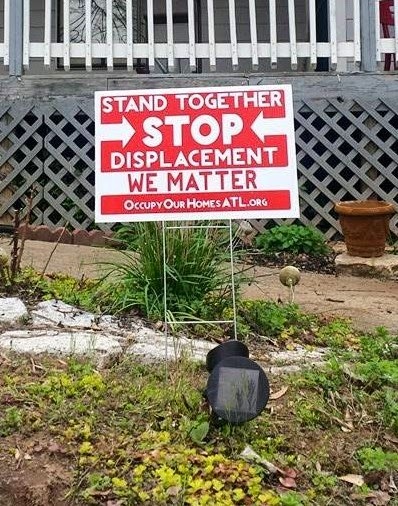 We have these new yard signs that read, “Stand Together, Stop Displacement, We Matter”. They look great and they provide a visible housing justice presence in the community. We have a lot of ground to cover and we’re about out of our initial order. These signs aren't cheap! In fact they cost $8 a piece! So we hope, with your help, to raise at least enough to order 100 more ASAP! Can you help us raise $880? Your dollars will help us build the door to door housing justice visibility we need in the community! 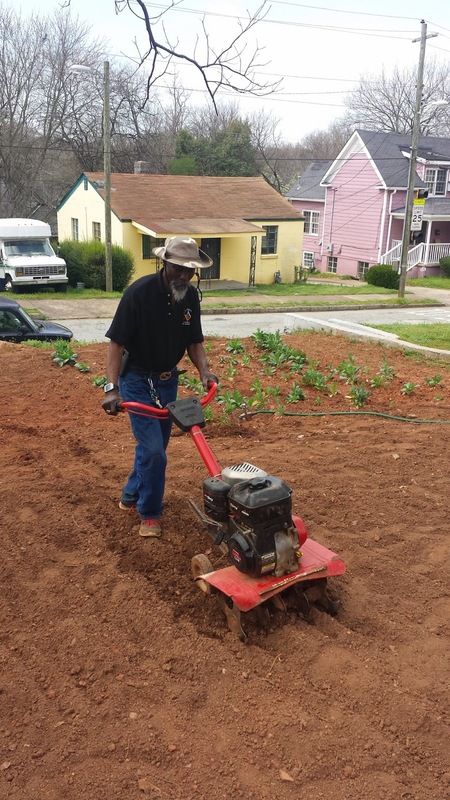 Tommy Moore has been growing food all over the struggling Pittsburgh community, located just south of downtown Atlanta. Pittsburgh lost 86% of its wealth during the financial crash. Half of the homes are still vacant and gunshots can be heard every night. It's a virtual food desert. Tommy needs $200. To buy new seeds and replace tools. Will you help me have his back? Lastly, WE NEED CANVASSERS! We are doing three canvasses a week and need more volunteers to knock on doors. We always meet AT 1101 Hank Aaron Drive, SW (Brick Building)30 minutes early to do a brief canvassing training and go over talking points. Please come if you can!